How do I import modules in pycharm? fails as an undefined reference. However, it works fine in the Python interpreter from the command line. GNURadio works fine with python outside of Pycharm. Everything is installed and configured how I want it. Go into File → Settings → Project Settings → Project Interpreter. Then press configure interpreter, and navigate to the "Paths" tab. Press the + button in the Paths area. You can put the path to the module you'd like it to recognize. But I don't know the path..
Open the python interpreter where you can import the module. You want to add foobarbaz to the path here. You should never need to modify the path directly, either through environment variables or sys.path. Whether you use the os (ex. apt-get), or pip in a virtualenv, packages will be installed to a location already on the path. In your example, GNU Radio is installed to the system Python 2's standard site-packages location, which is already in the path. Pointing PyCharm at the correct interpreter is enough; if it isn't there is something else wrong that isn't apparent. It may be that /usr/bin/python does not point to the same interpreter that GNU Radio was installed in; try pointing specifically at the python2.7 binary. Or, PyCharm used to be somewhat bad at detecting packages; File > Invalidate Caches > Invalidate and Restart would tell it to rescan. 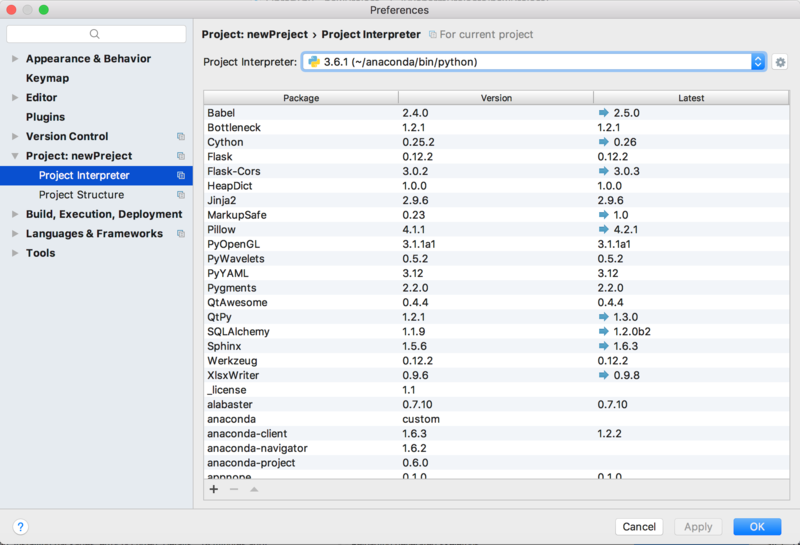 This answer will cover how you should set up a project environment, install packages in different scenarios, and configure PyCharm. I refer multiple times to the Python Packaging User Guide, written by the same group that maintains the official Python packaging tools. The correct way to develop a Python application is with a virtualenv. Packages and version are installed without effecting the system or other projects. PyCharm has a built-in interface to create a virtualenv and install packages. Or you can create it from the command line and then point PyCharm at it. 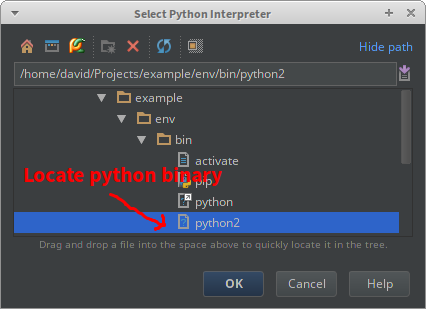 In your PyCharm project, go to File > Settings > Project > Project Interpreter. 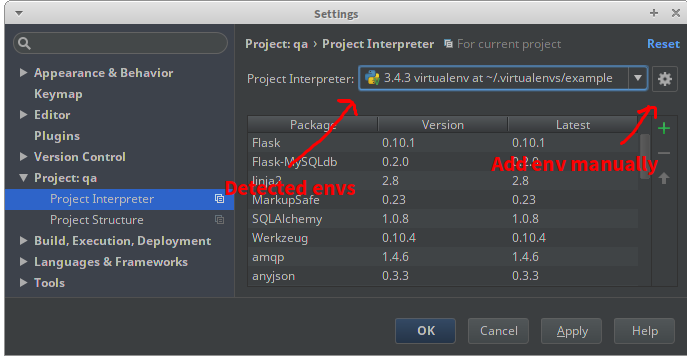 If you used virtualenvwrapper or PyCharm to create the env, then it should show up in the menu. If not, click the gear, choose Add Local, and locate the Python binary in the env. PyCharm will display all the packages in the selected env. In some cases, such as with GNU Radio, there is no package to install with pip, the package was installed system-wide when you install the rest of GNU Radio (ex. apt-get install gnuradio). In this case, you should still use a virtualenv, but you'll need to make it aware of this system package. Unfortunately it looks a little messy, because all system packages will now appear in your env, but they are just links, you can still safely install or upgrade packages without effecting the system. In some cases, you will have multiple local packages you're developing, and will want one project to use the other package. In this case you might think you have to add the local package to the other project's path, but this is not the case. You should install your package in development mode. All this requires is adding a setup.py file to your package, which will be required anyway to properly distribute and deploy the package later. For me, it was just a matter of marking the directory as a source root. My version is PyCharm Professional edition 3.4, and the Adding a Path part is different. You can go to "Preferences" --> "Project Interpreter". Choose the tool button at the right top corner. Then choose "More..." --> "Show path for the selected interpreter" --> "Add". Then you can add a path. "Project Interpreter" -> Top right settings icon -> "More". Then on the right side there should be a packages icon. When hovering over it it should say "Show paths for selected interpreter". Click it. Then click the "Add" button or press "alt+insert" to add a new path. On Project Explorer, you can right click on the folder where the module is contained and set as 'Source'. It will be parsed in the Index for code completion as well as other items. Go into Settings -> Project Settings -> Project Interpreter. I'm new to PyCharm (using 2018.3.4 CE) and Python so I rotely tried to follow each of the above suggestions to access the PIL (Pillow) package which I knew was in system-site-packages. None worked. I was about to give up for the night when I happened to notice the venv/pyvenv.cfg file under my project in the Project Explorer window. I found the line "include-system-site-packages = false" in that file and so I changed it to "true". Problem solved. Not the answer you're looking for? Browse other questions tagged python pycharm gnuradio or ask your own question. Python, Django with PyCharm. Message error: “No module named M2Crypto” How resolve? How to fix error “ImportError: No module named 'selenium'” on Windows? PyCharm how to include wxPython library path/Can I download wxPython? How to import a module given its name? How to install packages using pip according to the requirements.txt file from a local directory?